Please note–At this point, all but one library is out of glasses and it is doubtful there will be any left for the public once their programming (Collbran–see below) is finished. The library district (8 locations) split the few glasses we received between locations, with the sole purpose of developing educational programming for children and their families. We did not expect the overwhelming public request for glasses, or we would have ordered many more! Fruita will hold an eclipse watching party on the morning of 8/21 and will have glasses for the community to share as well as other options for viewing the eclipse. Here are instructions for making a viewer from a cereal box, and here is a video explaining how to make a similar viewer from other types of boxes. We apologize for the inconvenience and thank you for your patience. Mesa County Libraries plan to host eclipse-related events and will offer a limited number of special eclipse-viewing glasses in preparation for the solar eclipse Aug. 21 (see specific events/dates/locations below). A total solar eclipse will occur several hundred miles north of Mesa County on the morning of Monday, Aug. 21, 2017. In Mesa County, local residents will experience a partial solar eclipse in which about 87 percent of the sun is obscured by the moon. It will be a unique astronomical event worth watching, but to prevent serious eye damage, you must view it through special glasses or with an easy-to-make eclipse viewer. Here are instructions for making a viewer from a cereal box, and here is a video explaining how to make a similar viewer from other types of boxes. 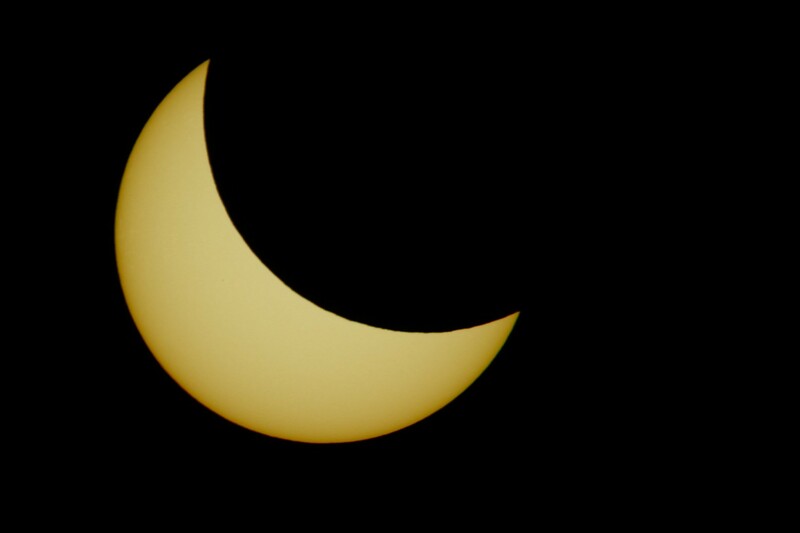 Children’s events at Mesa County Libraries during the week leading up to the eclipse will discuss eclipses and other space-related topics (including a session at the Collbran Branch about how to build a viewer from a cardboard box). Eclipse-viewing glasses will be available free of charge to children and their families who attend the events, and a limited number of glasses will be available to the public free of charge at library locations after the events. The glasses meet the requirements for ISO 12312-2:2015 relating to eyewear filters for direct observation of the sun. Central Library, 443 N. 6th St., Grand Junction – OUT OF GLASSES AS OF 9:08 AM THURSDAY, 8/17. Clifton Branch, 590 32 Road – OUT OF GLASSES AS OF 8/16 AT NOON. Collbran Branch, 111 Main St.
Collbran Branch Story Time at 10:30 a.m. Friday, Aug. 18, will feature eclipse activities, and eclipse glasses will be available to children and their families who attend. “Build a Safe Solar Eclipse Viewer” will take place at 10 a.m. Saturday, Aug. 19, at the Collbran Branch. A limited number of eclipse glasses will be available to those who attend. If any glasses are leftover after the above programs, they will be handed out to the general public. Fruita Branch Story Times at 10 a.m. Monday, Aug. 14, and 10:30 a.m. Wednesday, Aug. 16, will feature a space theme, and eclipse glasses will be available to children and their families who attend. Eclipse-Watching Party, Monday morning, Aug. 21: On the morning of the eclipse, the Fruita Branch will host an eclipse-watching party on the back lawn of the Fruita Community Center. Glasses will be available to share for viewing and we will also offer alternative methods of viewing the eclipse. Gateway Branch, 42700 Highway 141 – NO GLASSES ARE AVAILABLE AT THE GATEWAY BRANCH. Orchard Mesa Branch, 230 Lynwood St. – OUT OF GLASSES AS OF 10:05 AM 8/18. Palisade Branch, 119 W. Third St. – OUT OF GLASSES AS OF 8/16 AT NOON. Posted in Branches, General, Library News, Programs/Classes. I am very pleased at all of the changes that are being made at the Mesa County Public Library. You guys are right on track. God bless you and have a great day.